hair to look how I wanted, which products my hair likes and less frustrated. also don’t think I’ll be doing a monthly review anymore…not necessary anymore. I will do yearly reviews now…makes more sense to do methinks. regret is I didn’t go natural earlier, lol. This concludes my retrospective posts of my first year being fully natural. I hope you’ve enjoyed reading them and have been inspired by my experience – the ups and the downs. 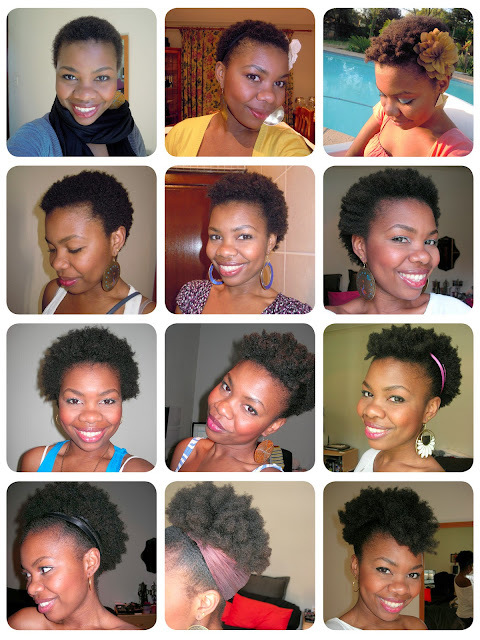 Going natural isn’t a piece of cake for everyone and it certainly wasn’t for me. For the full series, have a look in the Being Natural page. Thanks a lot for sharing your journey! I thought I was going insane, did feel ugly at the beginning of my transition. I'm currently in love with my fro, you such an inspiration! Wow inspirational. So in the first year you protective styled your hair about 4 times for short periods of time….am I right in thinking every night more often than not you either twisted it or braided it…is that how you achieved growth? You and your Fro, notice my admiration by adding the capital letters, are brave.I've recently started to Transition which is challenging. It's great see someone online in South Africa that has taken the plunge to embrace natural hair. I just think you are too adorable! Congrats on deciding to wear your hair the way nature intended! I have been natural for many years. It is definitely a journey of discovery! I love the variety of hairstyles! I will definitely be using them on my hair! Our hair is similar in texture, so I feel confident the styles will come out equally as glam as yours did! Thanks again for sharing your process! your hair has really thrived! I think you're the only person i've seen with a length update in a fro. You don't try to stretch it for comparison. shows you really embrace your fro and its shrinkage. Hi Aisha, I read somewhere that you are only doing annual updates on your hair's growth. Please shorten that period to at least quarterly or something. I'm just over a year behind you and I like that I can use your growth and challenges as a benchmark. I know everyone's hair is different, but it gives an idea on what to expect. Pls indulge me. Cheers.